37 arrested by the Italian Police. Operation “Revenge 5” partially stop drug trade in Catania, Sicily. Narcotics were transported by ambulance. The Italian Police in the city of Catania arrested 37 members of the Cappello-Bonaccorsi Clan. They were involved ina specific drug trade, using ambulances. The cocaine traffic was established with the complicity of 2 first responders, Antonio Cosentino and Salvatore Spampinato. 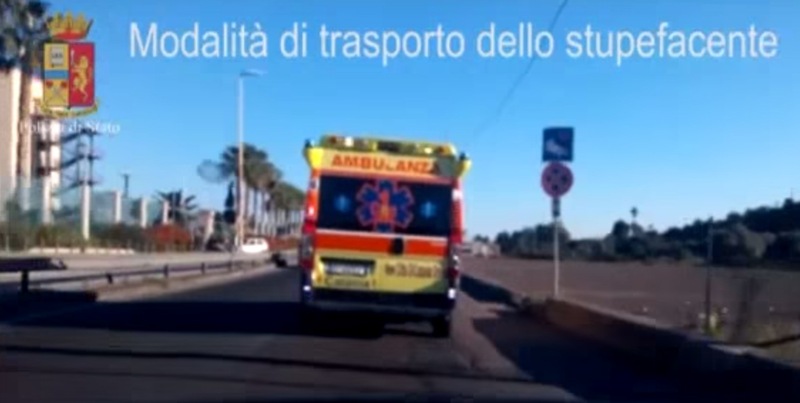 They used ambulance on call for going faster among the city and selling more drugs. A similar story happens in Colombia in june, 2015. Colombian national police have confiscated 214 kg of cocaine and have also apprehended five persons who were transporting it by ambulance. Among the arrested is one doctor, identified as Edgardo Figueroa, who was heading the cocaine trafficking operation. According to the authorities, he is a medical professional specialising in surgery and he worked in the municipal hospital. Figueroa was also a candidate for the position of Mayor in the city of Puerto Caicedo. According to police, the ambulance was stopped on a road leading to the Atlantic coast, in the rural zone of Cimitarra in the department of Santander. Its goal was probably to reach the major Colombian port of Cartagena, which is a center of narcotic-trafficking networks that transport drugs to the USA. The vehicle was stopped on a routine check but, after inspection, they found out that the vehicle had a false ceiling that turned out to be a hydraulic stash which functioned by a pressure system. The ambulance had standard medical marks which allowed it to avoid police and facilitate its trip. The five traffickers pretended to be a part of a medical mission in order to better deceive authorities. One member was playing nurse, two woman were acting as his assistants, Figueroa was acting as the senior practitioner and the driver was dressed in a medical suit. This is not the first time that Colombian drug traffickers have used strange and innovative methods in order to overcome ever stronger measures that are being used against them. Among the most interesting are submarines constructed by cartels to transport drugs, breast implants filled with cocaine and dogs whose abdominal cavities are stuffed with drug bags.